The aim of this paper is to explore prison's class and symbolic dimensions in the Neoliberal Era. Neoliberalism was approached as the empowerment of the market which leads to the dismantlement of the social welfare state and to the strengthening of the penal state for the marginalised populations. Also, it was analysed as the 'conduct of conduct' in the Foucauldian sense, as it was argued that prison is a tool of government, functioning for the management of the marginalised populations. An effort was undertaken to discuss the differences of the US, the 'carceral example', with the European Union countries. The class and symbolic dimensions of punishment were first approached from a historical and a theoretical perspective respectively, before attempting to discuss neoliberalism, aiming to show the maintenance of prison's main characteristics through time under capitalism. It was argued that the dismantlement of the welfare state brought to the fore the destabilisation of the labour market and the concurrent strategies of responsibilisation which led to the increased use of imprisonment. The result is the phenomenon of mass imprisonment, mainly affecting poor and marginalised populations and communities, leading to their further exclusion and social control. Furthermore, the relation of the industry with the penal policies was discussed, as part of the passage from welfare to 'workfare' and 'prisonfare'. Concerning the symbolic dimensions of prisons, it was argued that the dominant representations of the criminals should be explored under the scope of the demonisation strategies, which aim to legitimise the harsher penal policies and to naturalise the discourse on 'criminal classes'. Therefore, emotional attitudes are emphasised, as leading to the uncritical acceptance of mass imprisonment. On the other hand, the risk management strategies were discussed, which despite having rationalistic and apolitical objectives, disguise the responsibilisation strategies of the neoliberal era and the narrative of institutionalised insecurity. The analysis of the actuarial practises showed that the targeting of the population as a whole marks the transition from the disciplinary society to the control society. 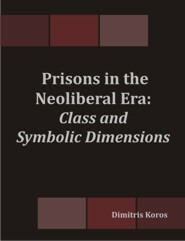 The objective of this analysis was to establish an account of neoliberalism and the phenomenon of mass imprisonment, contributing to the radical analyses on prison aiming to provide argumentation for the promotion of radical social action towards prison abolition.